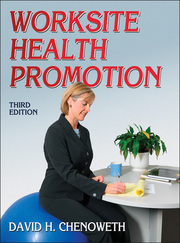 The image bank for Worksite Health Promotion, Third Edition, includes most of the figures and tables from the text, sorted by chapter. Images can be used to develop a customized presentation based on specific course requirements. A blank PowerPoint template is provided so instructors can quickly insert images from the image bank to create their own presentations. The image bank is free to course adopters and available at www.HumanKinetics.com/WorksiteHealthPromotion. For use outside of a college or university course, this image bank may be purchased by clicking on the Add to Cart button near the top of this page and proceeding through checkout. Once your order is complete, you can immediately access the content at www.HumanKinetics.com/WorksiteHealthPromotion.